Two more Sherpas died increasing the total to five Everest deaths and one on Lhotse this season. Again these tragedies cast a pale over the amazing weather for #Everest2018. Several of the few teams left summited on the Nepal side in what is being called “perfect weather.” The summits Tuesday morning 22 May marks the 10th straight day of summits. Three of the oldest Everest guide companies summited this morning, Alpine Ascents International (AAI) and International Mountain Guides(IMG) on the Nepal side and Altitude Junkies from Tibet. They selected a strategy of summiting near the end of the weather window thus basically had the normal routes all to themselves. On the Tibet side, working for 7 Summits Club, Pasang Norbu Sherpa (41) from Khari Khola in Solukhumbu died at 28,051’/8550m, site of the high camp . He was on their summit push and was found later by other Sherpas, lifeless on May 18 according to this source. There is no mention of his passing on the 7 Summits Club site where they cite their 100% success with no injuries or frostbite. The article also mentions Seven Summit Adventure as the expedition organizer. These 2018 deaths bring the sad total to five on Everest and one on Lhotse. Overall 293 people (175 members and 118 Sherpas) have died on Everest from 1921 to 2018. A median of 4 people have died each year on Everest since it was first attempted in 1921. Focusing on modern times from 2000 to 2018 deaths have increased to 6 annual deaths, heavily driven by the 28 Sherpa deaths on the South side in 2014 and 2015 from the serac release onto the Icefall and the earthquake. Looking at death rates from 1900 to 2017, they were about the same for both members and hired, 1.18 and 1.9 respectively. But when commercialization began in earnest on Everest in the early 1990’s the member death rate shot up to 2.09. In the modern era of commercialization, death rates for members and hired have lowed to 1.04 and .64. The last year with no deaths with in 1981. 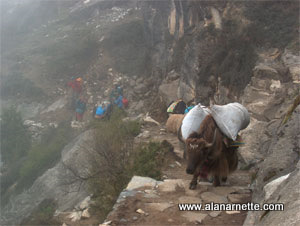 There was also a death on Shishapangma and Makalu this season in addition to one on Nanga Parbat over the winter. See this post with more analysis of summits and deaths. IMG finished up their 20-18 season with their last team on Everest summiting between 5 and 6:30 am, 5 members with 7 Sherpas summit from the Nepal side and one members and Sherpa on Lhotse. Looks like Altitude Junkies also summited this morning but no details on names or size of team, etc. Other than Rupert Jones Warner, there may be no one left on the Tibet side but I’ve learned over the years to never say never about anything that has do with Everest! “Failed regulators are being collected in the next two weeks as they return to Kathmandu and will be shipped to a laboratory for testing. Work has started to enable us to reproduce the failure. To this end we are looking to make the environmental chamber conditions as representative of the conditions experienced by the expeditions, for example high humidity, and the circumstances surrounding the events. I have travelled to Nepal to capture as much data as possible from the teams as they return to aid this process. More detailed tests that isolate individual parts of the regulator are being designed to enable us to see if there are any issues that could be behind the relief valve opening. Looks like Summit Climb will be one of the, if not the last commercial team on the Nepal side to go for the summit on Wednesday morning 23 May. This will be Summit Wave 10. Rupert Jones Warner was last reported traveling to the Tibet side a few days ago for his double Everest attempt. He summited from Nepal on 17 May. Unclear if he is still climbing. Horia Colibasanu and Peter Hámor are on the Nepal side hoping to summit via the West Ridge then traverse to Lhotse. They are concerned about the incoming weather since they need several days. Not looking good for their effort as we near the end of the season. Weather is expected to pickup on 25 May. Their last update on their plans was 18 May saying they were at Camp 2. Tenji Sherpa and Jon Griffiths, provided a video update on their plans to summit Everest by the normal, Southeast Ridge route, then return to the South Col and on to Lhotse back to back with Tenji not using supplemental oxygen. The no Os part of this is why its special plus it will be live streamed on the Nat Geo Facebook page. For such a unique event, I find it confusing to understand what they will be live streaming. They are supposed to be at C2 on the 23, then move to the South Col on the 24, summit the morning of the 25 and on to Lhotse the same day or the 26. However, in this video, Tenji says they will be finished by the 25. Its unclear how much of this time will be streamed, but I assume it can be seen later. Go to the Nat Geo video page and look for the Everest live stream link via the row of videos. Well done to all thus far and my condolences to the families, friends and teammates of the Sherpas who died. Please consider supporting the Juniper Fund who provides financial assistance for the families of Sherpas who die while guiding. Hi There, my husband just summited Mt Everest and Lhoste in the last 24hours! I was wondering if I could get a copy of the photo you have attached here that depicts the routes of their climbing routes to the camps and Mt Everest. I was hoping to gain a better resolution of this picture to get it printed on a welcome home poster for him. He is due back on Sunday and I am hoping to have it done by then.